Seattle DJC.com local business news and data - Architecture &AMP; Engineering - Is modular the answer to affordable housing? 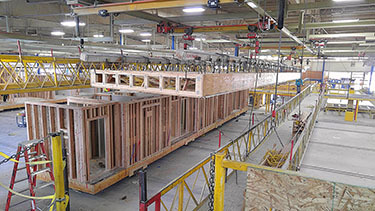 Developers must view modular construction as the sum of many parts that add value. 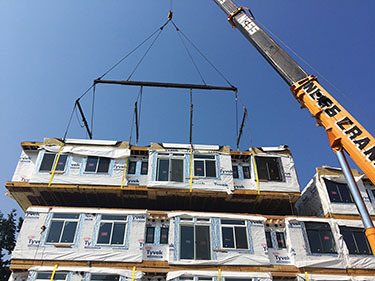 Modular design and construction are having a moment, with increased interest in their potential for efficient and affordable housing. As with any new technology, expectations are high that modular will solve problems that plague the construction and development industry. Many companies and venture capitalists are spending millions trying to disrupt all parts of the development spectrum, attempting to reform design, construction, lending and municipal practices. Faced with an affordable housing crunch, the city of Seattle, King County and other jurisdictions hope that new solutions such as modular will quickly remedy a growing problem. While there have been a few modular housing projects in Seattle, the numbers are not as anticipated. Many are left wondering why developers haven’t taken advantage. 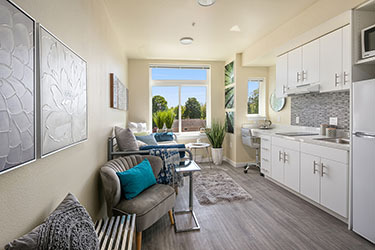 Parkstone Properties developed Cubix North Park with 101 micro-apartments. A crane set the units at the jobsite in North Seattle. Modules were built in an Idaho factory and trucked to Seattle.